Disheartened by what he described as an erosion of his spirit and altering of his personality, Rick Ankiel changed the course of his baseball career. On March 9, 2005, Ankiel announced he was transforming from a pitcher to an outfielder. 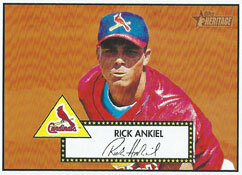 Ankiel, 25, entered 2005 spring training at Jupiter, Fla., as a strong candidate to earn a Cardinals Opening Day roster spot as a left-handed reliever. After posting an 11-7 record with 194 strikeouts in 175 innings in 2000, Ankiel experienced a meltdown in the postseason against the Braves and Mets (nine wild pitches and 11 walks in four innings). He pitched briefly for the 2001 Cardinals and suffered a series of elbow injuries before returning to the big leagues with St. Louis as a reliever in September 2004. Ankiel pitched in the Puerto Rico winter league after the 2004 Cardinals season, but cut short his stay there after experiencing a twinge in his left elbow. When he got to Cardinals camp in February 2005, his throwing sessions were erratic. On March 8, 2005, the day before he was scheduled to make his spring training debut against the Marlins in a morning B squad game, Ankiel approached Cardinals manager Tony La Russa and informed him he was retiring as a player. Ankiel’s agent, Scott Boras, called Cardinals general manager Walt Jocketty and asked whether the club would be willing to let Ankiel go to the minor leagues, be an outfielder and get a chance to earn his way back to the majors. When Jocketty agreed, Boras called Ankiel, who was surprised by his agent’s actions, and convinced him to give the transformation a try. The next day, Ankiel was spotted taking indoor batting practice off pitches from Cardinals scout Jim Leyland. In a hastily called press conference, Ankiel announced his plans to switch positions. “The frustration of not being effective, not being able to go out there and replicate my mechanics, and the way it affected me off the field, wasn’t worth it,” Ankiel said to the St. Louis Post-Dispatch. “The reward wasn’t there. I feel relieved now. It’s time to move on. As a Cardinals pitcher, Ankiel hit .207 for his career with two home runs and nine RBI. He hadn’t played the outfield since his senior year at Port St. Lucie High School in Florida. The reaction to his plan drew skepticism. Ankiel began receiving instruction from coach Dave McKay on outfield play and from coach Hal McRae on hitting. Out of options with the Cardinals, Ankiel could have been chosen on waivers by any of the other 29 big-league clubs before he was sent to the minors in the spring of 2005, but no one claimed him. Ankiel hit .285 with 11 home runs and 39 RBI in 47 games for the 2007 Cardinals. The next year, he slugged 25 home runs for St. Louis. From 2007-2013, Ankiel was an outfielder for the Cardinals, Royals, Braves, Nationals, Astros and Mets. In 2010, a decade after his wild streak against the Braves in the National League Division Series, he hit a home run for them in the NL Division Series against the Giants. Boxscore Ankiel and Babe Ruth are the only big-league players to both start a postseason game as a pitcher and hit a home run in the postseason as a position player.